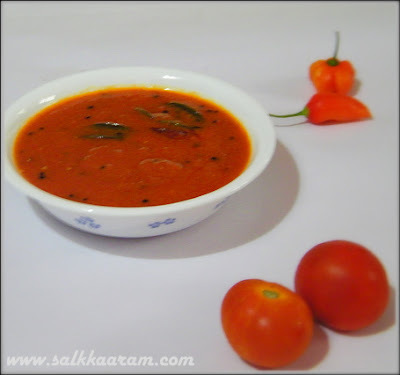 Tomato Chutney | Simple and Delicious ! Ladies of our neighbourhood would have a usual talk when they see each other, "innentha meen kittye? "(Which fish you bought today? ).Recently a lady commented that she didn't like the way those ladies talk and these kinds of inquiries are not sincere! I always believed ladies from the village areas start a healthy conversation by asking such silly matters. And their relationships get stronger because of these regular chitchats! It is difficult to understand for those who live in cities especially who thinks that the world is me and my family only..
Chop and Blend tomatoes in little water with shallots and garlic. (You can use peeled tomatoes also). Heat oil, allow mustard seeds to splutter, fry curry leaves and pour the tomato mixture into this. Allow to boil , remove from fire. 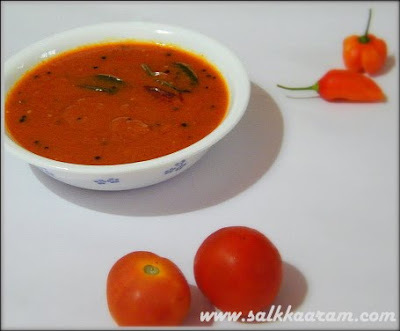 See thakkali chutney recipe here..
MY WIFE BEENA MADE THIS DELICIOUS DISH JUST NOW , 5 MINUTES AGO. SHE HAD LITTLE FISH CURRY LEFT OVER AND I TOLD HER I CANT EAT THAT. THEN SHE SAID NOTHING IS LEFT IN THE KITCHEN EXCEPT SOME TOMATOS. INCIDENTLY I SAW YR LATESTG POST. SHE MADE IT AND FOUND SO TASTY AND SHE TOOK THE MAXIMUM PORTION. I HV SENT THE LINK TO MY DAUGHTER IN LAW WHO IS IN COIMBATORE. SHE SAID TAMILIANS MAKE SIMILAR DISH, BUT NOT TASTY LIKE THIS. THANKS A LOT AGAIN SEENA. THis one goes well with Idly and Dosa! Mouthwatering recipe. Each one will have their own version of tomato chutney. Loved ur version. We call this as raw tomato chutney. My fav... YUM! i agree.. tomato curry is a boon when there is no other spicy curry at meal times.